Centrally located in downtown Midland, beautiful Dow Diamond is easily accessible from Business US 10. 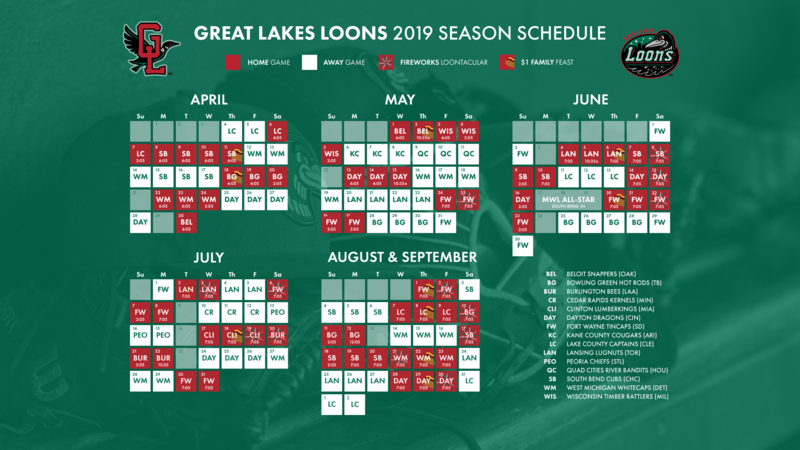 The state-of-the-art facility is home to the Great Lakes Loons, Class A affiliate of the Los Angeles Dodgers. The Loons played their inaugural game at Dow Diamond on April 13, 2007. Over 324,000 fans flocked to Dow Diamond that first season, and over 2 million total since. Dow Diamond has established itself as one of the premier minor league stadiums in the country, earning several awards in the process. I-75 N to US 10 W. Take the M-20/US-10 BUS exit on the LEFT toward DOWNTOWN MIDLAND. Merge onto US-10 W/MI-20 W. (also known as Indian St.) Turn LEFT onto State Street. The entrance to the stadium is located at the intersection of Ellsworth and State Streets. Take M25 - which becomes US 10 W. Take the M-20/US-10 BUS exit on the LEFT toward DOWNTOWN MIDLAND. Merge onto US-10 W/MI-20 W. (also known as Indian St.) Turn LEFT onto State Street. The entrance to the stadium is located at the intersection of Ellsworth and State Streets. Take 27 to US-10 East toward Midland. Take the Bay City Road exit. Go East on Bay City Road. Merge onto US-10 West. Take the MI-20 / US-10-BUS exit on the LEFT toward DOWNTOWN MIDLAND. Merge onto US-10 BR W / MI-20 W. Turn LEFT onto State Street. The entrance to the stadium is located at the intersection of Ellsworth and State Street. Take M20 to Main Street in Midland. Turn RIGHT on Main Street until it intersects with State Street (Main Street ends). Turn left and enter the stadium at the intersection of Ellsworth and State Street (one block down).